May you all find peace this holiday. And may this new year bring us all prosperity and happiness. I´ll be taking a small break from work (and AM2R) these last 2 weeks of the year. I´ll have plenty of time to put into the project on January. This one is taken from the engine, that screen back there is from the actual game. The text is still part of each section´s bitmap, the values at the top are still fixed, and there´s still no validation for the switched abilities (you can toggle anything without having the item). But it´s functional, and it´s as far as it could get this year. As always, you´re free to post your oppinions, or just drop by and say hi. I´ll try to make some time to answer your questions. Ah, BTW, I replied to most people on the last post´s comments. If you asked anything back then, check it out. Well, take care, enjoy the celebrations and have fun. Doctor M64 congratulations! His game will be wonderful! I think a lot and I commend it to continue progressing in this project! I have an idea for his work ... You could add the game a "room to download maps of each levels" as well as Metroid Zero mission, to not be as confusing as in Metroid 2 Return of the Samus. That subscreen combines ZM, Fusion, and SM elements perfectly, right down to the shading on the subscreen Samus. This is an awesome subscreen. A map room would be a good idea, but instead of plugging into a terminal players could instead go into a morphball friendly structure like those found in Zero Mission and get a majority of the known map and some secret one that show only a few secret rooms! Other then that The SubScreens look better, keep up the excellent work! Just one more question for now. Will there be the same numbers of each kind of metroid as there were in the original game? Had not read your comment that brought me responded to my question ... So ignore the second cometary xD. I know this might not be a popular idea with all Metroid fans, but I think that something like the on-board computer we had in Fusion might be a cool way to replace the "remaining metroids" counters from the original game. Something like, the first time you reach the lava that blocks your path, your on-board computer pops up a message (or you just get a "new message" notification, which you can choose to ignore...) with some text that tells you that a metroid has been detected. You've been doing really well alone so far, but if you don't want to worry about writing each of those AI messages, I offer my services. If you want me to "prove myself" first, just assign me a specific bit, and I'll write you something that will (hopefully) blow you away. Thanks for working on this. I still don't understand why no one at Nintendo is working on an update to Metroid 2, it's such a prime candidate for a remake/expansion, the way Zero Mission was done, that it seems like a no-brainer. Are those variants of the GB Metroid 2 tiles I'm seeing in that screencap? If so, that's a good thing. My only complaint with the last demo was that there were parts of it that didn't feel much like SR388. Capturing and 'enhancing' the LOOK of SR388 will be the difference between making a remake that's good, and one that's the absolute best. As always, looking forward to this. Keep the updates coming, I love every one. This Fan-Game is very good. I'm French and I want to translate your game in french at the final version. At OK contact me at: "metroid_zam@hotmail.fr"
Well, it's looking really good, but I'm getting worried about the file size of the actual game. The last demo took me almost two hours do download, and you'll have to think about people with slow internet connections that want the game. But, you must've been working hard all year. You probably need those two weeks to take a break off of! Good to see you implemented some of my ideas already. liek dead Fed troops and stuff. There is nothing more to say. While i do support the Idea of a computer instead of the remaining metroid stuff, i disagree with placing him on the map. maybe as subscreen in samus inventory, if any. lets see, any ideas from me... oh yes. In the intro movie, make it significant that Samus just came back from her adventures of Metroid Prime 3 Corruption. And then the ending must include some hint about Samus Showing the Metroiod hatchling to the scientists and Ridley showing up. This is so that people can understand where this game falls in the time line. Oh and thank you for saying you'll include a brand new area (for gravity suit and power bombs)!!! I'm personally against too much backstory. Onboard computers would take away the main thing in metroid, that is the factor of loneliness, not knowing exactly what to do or where to go. No space pirates/metroid prime/phazon bulshit either. Good old 2d metroid as you seem to be doing now. Keep it simple. But beyond that, keep the game as close to its original feel as you can. Metroid 2 has such awesome potential, and I believe your game will give it what the concept deserves. or at least view it. So which one is the metroid your going to use? Looks great and Happy Holidays! it's the first time i see your blog! Good job! I have a question. From what I've noticed from game maker, and my own game... how long do you think the waiting will be? because in my game, I have an engine and three rooms, and it take forever to load. Muchas gracias por tu comentario :D.
Te felicito tambien por tu gran ezfuerzo y progreso en tu poryecto, siga adelante Doc! Busque la seccion Metroi 2 Return of the samus. Saldran cada mapa de todos los niveles de Metroid 2 y estan en colores. Espero que le sirvan! Doctor tengo una idea muy buena, nose si a usted ya se le ha pasado por la mente. En el Metroid 2 retun of rhe samus se encuentra un feje llamado arachnus que le otorga el poder "spring ball". 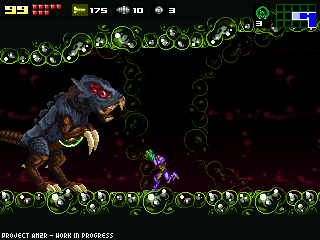 Bueno si usted lo piensa hacer en su proyecto podria ocupar los sprites del Metroid fusion, ya que arachnus aparece como primer jefe en el juego. Bueno si lo piensa hacer o si ya lo hizo podria ocupar este sprite que le mando en el link: http://img409.imageshack.us/img409/9304/mfarachnussm7.gif. I bet it's a decompiled version of your earlier demos. The graphics, sounds, gameplay, transitions, screen size and other stuff are exactly the same. Since Game Maker exes can be decompiled, somebody wanted to make a metroid game but couldn't program the basics himself. People with youtube accounts should go put some comments. I was also wondering if there are going to be many cutscenes. Who will draw them and the endings? yea your game looks way cool i cant wait to play it myself.you are doing an awsome job i downloaded your tech demo even the tech demo is great ive played it over 10 times.anyway happy x-mas and your game is gonna be a big hit to all poeple i have no ideas for you sadly but i think it is prefect i think it is the best metroid remake ever. in the other metroids you could use the diagonal aim button to shinespark diagonally. i noticed that this doesn't work in the demo. this feature makes it easier to perform if you are using an analog stick to control samus. This looks awesome! You are very multi-talented! Hey, I love the game, but I think the chozo statues should be replace with this one or the ones from zero mission. >Will there be the same numbers of each kind of metroid as there were in the original game? I have plans to add one or two new battles. >Are those variants of the GB Metroid 2 tiles I'm seeing in that screencap? Yes, that´s part of the outside of Area 3. It´s one of the first tilesets I´ve ever drawn. >Onboard computers would take away the main thing in metroid, that is the factor of loneliness, not knowing exactly what to do or where to go. Hmm... I always used the dpad, and didn´t know it could be done that way. I´ll add that feature right away. Hablo español, pero agradeceria que posteen en inglés, así todos entendemos de que estamos hablando (mucha gente no lee español). Ah, señor DarkMaster, le envié un email sobre las preguntas que hizo. I bet it's a decompiled version of your earlier demos. I contacted the author. That Metroid game ceased development. >I was also wondering if there are going to be many cutscenes. Who will draw them and the endings? There will be story cutscenes. I guess even now it´s too early to audition artists. Thanks for all your comments and ideas! Have a happy new year, take care! So which metroid style are your going to use? I prefer the new one. Artist Auditions...? Sweet! i've never heard of an artist audition before. Although i'm very confident with my artistic talent, I doubt i'd end up being the cutscene/content artist because i'm sure the competition will be big. But if for some reason, there is not much competition, i'll gladly do it. I look forward to knowing the audition details. I ask you, where have app. the game ended. Is that I have a great desire to play. I am eager to have it soon. Yeah, pretty nice screen. Hope for a good time. Happy New Year. Maybe you should put some status numbers in red if it's low. thank you for adding the shinespark thing. 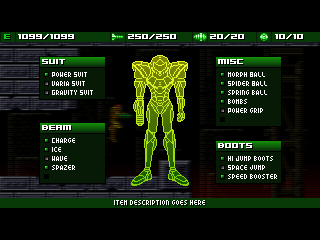 are you going to add any of the super metroid add ons like the grapple beam or the x-ray visor? It's NOT done by me! But i hope you will use it. Because the MII/SM style starship doesn't fit with the MZM style. FIRST COMMENT OF 2009 lol! I agree with SSSword Master regarding the use of the zero mission version of this ship. When I see you use the super metroid version of the ship, that really gives away the fact that this game is fan made. I know another metroid project is using that fan made zero mission version of the ship but it doesnt look like its theirs, so I really suggest you use it. Please consider it. I'm also hoping you make it so you stand on the middle and have to press down to go in, unlike in your demo where you simply fall in. I agree with the two about the MZM style super metroid/metroid 2 gun ship, and also instead of the super metroid chozo statues you should consider using the MZM ones, the super metroid ones look kinda weird..
awesome subscreen by the way. I have playing your Demo game and I think you are doing a very good work there. I am very ansious to play you AM2R completed, because I started to play Metroid 2: The Return of Samus and i am very lost what to do in there. So i hope you finish your game soon. Metroid II was done in a very limited palette that in the end only communicated shades of yellow on our Gameboys. Even so, I hope you keep the doom and gloom of the original game. I have always felt that Metroid II was a spiritual successor to the Alien movies in the foreboding techno-organic environment department. In my opinion the minimal sound design and ambient music used are also brilliant in this approach. I know it may be hard to keep the feel of the original game with the color happy Metroid Fusion having left it's mark on the series. I think that little touches like leaving the night sky on the surface could go a long way. Are you ever going to contact Nintendo about the project when it's finished? You might get recognized by them and it'll get ported onto the DS or something. I've been wondering about that ever sience you first started this blog. Hey... i just thought i'd mention this (its important). I searched through the some of the blog and i can't exacly find all the legal information regarding nintendo. so just to be safe, please put a clear link on the home page that explains the project and has all legal information. it'd be nice to have page that gives more detail about the project and yourself. @An_Artist: I'm gonna suggest that was shut down for the dual reason of A:) you'd need a burned copy of Brawl to even use those textures (Whether burned yourself or *ahem* through other means) and B:) you'd need to have made your Wii able to run such burn. Sure, you could try and question the legality of AM2R but Syntax Error was running straight into the wall of piracy. I'm curious if the final product would/could have a level editor built into it -- the game looks incredible as of the demo, and I'd really enjoy making a mission of my own using the completed game. We must congratulate the M64 Doctor! Has been given the time to do this project and satisfied with their progress. Doctor my support and I hope that soon we will all have their entire project on our PC! I had an idea for the spider ball, what if you could toggle it on and off by holding and releasing the diagonal aim button. I think it would make using the ability more functionable. You could be using the direction pad to move side to side while activating it. Also it could allow you to jump off the side of a wall with the jump ball feature while using the spider ball. With the hundreds or more Nintendo-based fan games being made at any given time, Nintendo actually doesn't go out of their way to shut down nonprofit fan-made projects. It's far more likely that the other project that was recently "shutdown" was due to the author getting tired of working on it and claiming he was told to shut as an excuse to not finish the game and still keep his street cred. I want to know when will app. draft ready for us to download. Yo Dr.! I was wondering how your going to do the alpha to gamma and zeta to omega metroid evoloutions. In the original, they kid of just grow with no cocoon, but in metroid fusion, each evoloution had a coocoon. Are u going to go with the cocoons, or are u going to have them mutate into there next form the way nintendo had in the original? Keep up the good work! This is shaping up to be the best PC Metroid experience to date. The gameplay works great and the artwork is spot-on! Though I prefer having a look-up and look-down button like in Super Metroid, and perhaps a button for dash as well. I'll be anxiously looking forward to seeing more! an unexpected error happened, what I do? Look at this metroid 2 remake i found a while back, its dead, but i want to show you the way they made the background for planet sr388, its incredible, just look at the planets surface. take a look. I do not think that serves as the doctor and have all the sprites and maps to SR388. Besides that game is dead. You never finish complete. Vaya parece que el inventario va tomando forma te felicito "Doc" ^^. Siento no hablar en inglés que lo escribo bien pero prefiero escribir así ya que me llevo mas fluido hablando. hm, ustedes enseriamente tienen que practicar el ingles un poco mas lol. no sabia que el doctor habalaba espaniol, pero como el, yo tambien prefiero ingles. Now then, how about a new update, what'r you gona work on throughout January? i'm still excited for those artists aruditions. Well it was just an idea of how he could've made his background for SR388, the moon, stars, ect. >So which metroid style are your going to use? The Alpha Metroid sprite seen in the latest trailer describes the overall style of the later Metroids. >Maybe you should put some status numbers in red if it's low. Good idea. I guess how much is considered low will depend on the ammount of Energy Tanks collected. >are you going to add any of the super metroid add ons like the grapple beam or the x-ray visor? No. Grapple beam is too complicated to make properly. Besides, keeping the grapple momentum will feel strange with Zero Mission physics, IMHO. I´m not sure about X-Ray, it takes away the rewarding feeling of finding a well hidden item. The game won´t be as massive as Super Metroid, so exploring the relatively small map won´t be a chore. >I agree with SSSword Master regarding the use of the zero mission version of this ship. Among other things, an original ship sprite is planned. >I have always felt that Metroid II was a spiritual successor to the Alien movies in the foreboding techno-organic environment department. Gunpei Yokoi was inspired by the Alien movies, we all know where the "Ridley" name comes from. I wonder how the Metroids would look like if they were designed by H.R. Giger. >I remembered how the above surface atmosphere shown in II was so extremely thin. Don´t worry, I´ll be redoing the surface of SR388 to match the desertic look described in the original Boxart and in the manual. The sky and background will be redone too. >Are you ever going to contact Nintendo about the project when it's finished? I don´t know. If they were interested in a Metroid 2 remake, they could assemble a development team and do it in 4 months. >I searched through the some of the blog and i can't exacly find all the legal information regarding nintendo. You´re right, I should add a disclaimer just in case. I´ll see if I can add a footer or something to the blog. >I'm curious if the final product would/could have a level editor built into it. It would require to change the way the levels are stored, and I should redo all the maps with this new format. No, thanks. >I had an idea for the spider ball, what if you could toggle it on and off by holding and releasing the diagonal aim button. I think it would make using the ability more functionable. Many people suggested this, I´ll try it out. >I was wondering how your going to do the alpha to gamma and zeta to omega metroid evoloutions. I was thinking of the original morph way, if we manage to make it look good. I´ll talk to HyruleSwordsMan about it, but if it´s too complicated I guess you´ll find the Metroids already evolved. >Though I prefer having a look-up and look-down button like in Super Metroid, and perhaps a button for dash as well. I´ll add the separate aim buttons, but not the dash one. Too bad the project is dead, I´d love to play that. The new surface will look something like that, I don´t know if it´ll look that good.